This is super random I know…and there is a very high probability that everyone knew about this before me, but I think it’s great, and it’s a huge help! 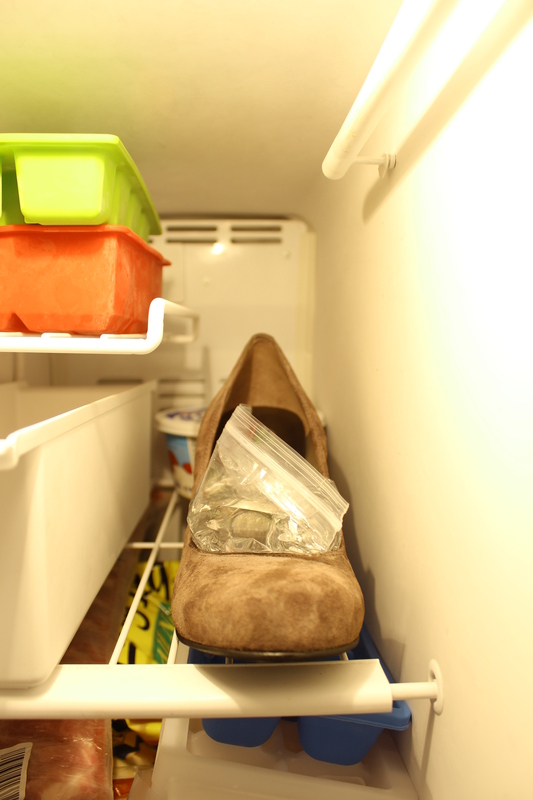 Stretching shoes…did you know what you could stretch them in the freezer? One of my co-workers shared this with me last year, and since then every knew pair of shoes that I get goes into the freezer. I just bought these shoes, and although I know it might be stupid, I’m stubborn, and I’m taking them to Europe this week. Everyone says don’t bring new shoes that aren’t worn in, but I need a pair of heels for the evening! What!? I’m a girl and we need heels! Cute, huh? But kind of tight in width, which is where the little trick comes in! Fill a zip lock bag of water just under half way. Make sure it is sealed well, and doesn’t have air trapped inside. The air won’t really do anything but make it harder to get the baggy down into the toe. The bag will stick over the edges of the shoe a little which helps stretch that area…again, make sure that the bag isn’t leaking. And pop them into the freezer. These were new shoes, so I wasn’t really worried about dirt, or I guess you could put them in a plastic bag and then into the freezer. I’m now looking at my shoe directly above the ice cube trays and realizing, maybe I should have done that just in case…oops, next time! I typically freeze them overnight, take them out in the morning, break out the ice, and then repeat once more and leave them in for the next day and night for a little extra stretch. Do not let the bags melt inside the shoes, that will lead to wet shoes, and might ruin them. Most of the time I can wiggle out the ice bag, or I break it out with the end of a knife. I’ve done this now with almost every new show I buy. I have found it to be very helpful…but again, I warned you, very random! Going to try on a new pair of flats . Can you do this with boots? I haven’t actually done it with boots, but I would assume so. I think the main complication would be getting the ice bags out. I’d just break the ice down to get it out. Just make sure you don’t let the bags melt inside…I wouldn’t want you to soak your boots! Good Luck! it seems like this would only with leather shoes. wonder if it could work on other materials as well? i have a fantastic pair of patent leather shoes that make me want to cry when i wear them, because they hurt my feet. and make me want to cry when i don’t wear them because they are so cute and i want to be wearing them! I have a couple of pair of canvas shoes that are a little tight in length. Do u think would work for these? I have a pair of glitter Tom’s shoes (Not sure what exactly they are made of but they are soft-sided). I guess they tell you to buy them smaller because they stretch out but I don’t want to wear them around until they do). I read about this and wondered if it would hurt the glitter by putting them in the freezer. Your thoughts? I don’t think the freezer would hurt the glitter. I’ve never tried, so can’t make any promises, but I’d think that since Toms are supposed to stretch, it would work. Thank you for your advice and can i use this for upper leather pumps? Inside and outside are both manmade leather..
I’ve used it on manmade leather – and it worked great. Do you do this one time (will it last? )… or do you do it every time you wear them? Great idea. Wish I could fit my boots in the freezer! You really helped me a lot. I have that kind of shoes, I don’t wear them because they make my feet not comfortable. Going to try this tip. I’m trying this idea right now with my new cute shoes! I’ll be posting the results on my blog in a few days but want to thank you for this idea! Oh and just thought I’d throw this out there: You could use a bag to keep used shoes from getting the freezer dirty… ooorrrr a hair shower cap :) Yep, I’m random too! Do you know if you could do this with leather work boots? My dad has some that he bought a little while ago but they are a little small. Thanks for the tip! I am sure I will use it! !